Finch Chalet #1010 is a spacious two story mountain cabin that sits on a wonderful treed lot, offering entertainment and the essentials needed to make wonderful memories here in the mountains. This home offers a full kitchen with cooking essentials, basic appliances including a dishwasher, plus a nice dining room area with a large table and a dining bar with stools for additional seating. The cozy living room has high vaulted ceilings, a toasty wood burning fireplace, comfortable furnishings, and a TV/DVD player for your enjoyment. Stepping outside, there is a fully fenced back yard with a nice big deck that includes a charcoal BBQ and a private outdoor hot tub for your use. 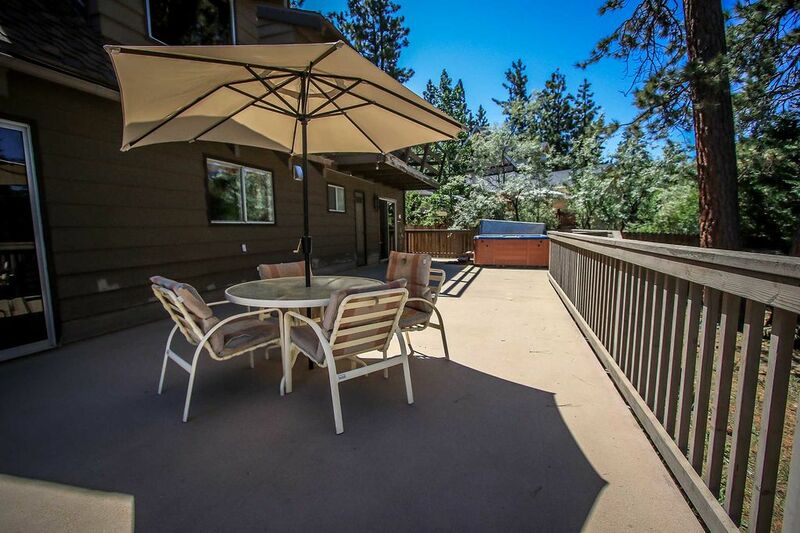 Finch Chalet is located within walking distance to the lake and a local park, yet is under a ten minute drive to all that Big Bear offers including shopping, ski resorts, dining, and entertainment, making this home the perfect choice for your next mountain vacation! Please take the time to read our listing thoroughly and completely to make sure that this is the right property for you. Your booking request and or confirmation of booking constitutes the acceptance of the below House Rules and complete acknowledgement of listing description, amenities and check-in procedures and rental policies. HOUSE RULES: AGE & CC REQUIREMENT- Big Bear Vacations requires a minimum age of 21 or older to reserve our homes. This property is a licensed and registered Transient Private Home Rental, regulated by City of Big Bear Lake municipal codes. The renter booking the property is required to sign an Occupancy Agreement, which will be provided by the Host via email after booking is confirmed. The guest whose name appears on the credit card charged for your reservation MUST BE PRESENT with valid photo ID at the time of check-in to release property keys. **PLEASE CALL WITH YOUR ETA ONCE BOOKING IS CONFIRMED** CHECK-IN IS REQUIRED AT OUR BIG BEAR VACATIONS OFFICE- NOT THE PROPERTY! Check In: 4pm Check Out: 10am No Parties, Events, or Smoking Allowed Big Bear Vacations- 41693 Big Bear Blvd, Big Bear Lake CA- 92315 (909) 866-8200 Standard Office Hours For Check In: Monday - Thursday : 8:00 am to 9:00 pm Friday : 8:00 am to 11:00 pm Saturday & Sunday : 8:00 am to 8:00 pm **LATE CHECK-IN OPTIONS ARE AVAILABLE!! ** Please Call To Arrange This Option! PROPERTY CHECK / HOME QUALITY- You the tenant are financially responsible for any damages to our home during your stay. Big Bear Vacations homes are privately owned properties that are inspected prior to your arrival, however if there is anything that you notice or feel that we should be aware of please contact us within 1 hour of your arrival at (909) 866-8200 or you can send us an email to info@bigbearvacations.com. Please check upon arrival that your cabin has working heat, power, hot water, and the hot tub is working (if applicable) due to changing mountain climates and conditions. Big Bear Vacations does NOT offer refunds due to any circumstances outside of our control including but not limited to: weather or road conditions, acts of nature, mechanical or electrical failure or malfunctions with spas, TV's or other equipment, or the sighting of insects, bugs, or rodents. NEIGHBORHOOD TRANQUILITY- You are a guest of the owner and Big Bear and will be staying in a residential neighborhood area. Please understand that you agree to respect the tranquility of the neighborhood and those around you, and that disturbing the peace is a direct Violation of City Ordinance which could result in fines and or immediate eviction without refund. TRASH REMOVAL- Guests are required to remove & dispose of their trash to the proper dump site (Per City Code) provided at check in and to wash and put away their dishes prior to departure. Failure to dispose of trash properly will result in a disposal fee of $25 PER BAG REMOVED. OCCUPANCY & PARKING- Each property is licensed to accommodate a maximum number of guests (including children) and vehicles at any given time during your trip. It is very dangerous and illegal to over occupy any property as these regulations are set by the City or County and are non-negotiable. Winter snow will likely reduce parking by 1 vehicle, please plan accordingly and use common sense when parking in the winter months. NO STREET PARKING IS PERMITTED IN BIG BEAR. Violation of occupancy and parking regulations can result in fines, vehicles being towed, and possible immediate eviction without refund. HOT WATER- Mountain cabins are generally equipped with 15 - 40 gallon water heaters per home, depending on the cabin size and water heater type. It takes more hot water to heat in Big Bear for bathing comfort due to the low outdoor temps, meaning you will quickly deplete a 40 gallon water heater when showering, doing dishes and or laundry. In the event that you have loss of hot water, and can verify that it is engaged and working, you will need to allow for recovery time for the tank to refill and reheat your supply. PETS- Many of our homes are pet friendly and accommodating to your fur-babies however there is a non-negotiable pet fee of $10 per pet, per night in these particular homes. AMENITIES- Though most of our homes are fully furnished with the essentials, utensils, cooking supplies and linens, please note that Big Bear Vacations does not supply shampoos, soaps, hair dryers or laundry detergent. Being individually owned, each property amenities and offerings are listed to the best of our current and active knowledge, though some changes since the photos were taken and published are not completely guaranteed. INTERNET- Big Bear Vacations does NOT offer a Warranty for Internet use during your stay. This amenity and related equipment is offered to the guest “as-is” without warranty or guarantee of any kind. HOT TUB- If the hot tub/spa becomes non-operational at any time during your stay Big Bear Vacations will do our very best to repair or contact the owner's service company to repair in a timely manner for you. Big Bear Vacations does NOT offer any guarantees, refunds, or compensation if non-operational during your stay. WEATHER/SNOW REMOVAL- California Law requires that if traveling to Big Bear during the winter months (November to April) that you carry snow chains for your tires with you IN your vehicle. Snow removal is the responsibility of the guest. Shoveling may be required to gain access to the cabin, as well as decks, porches, BBQ and hot tub areas. A snow shovel will be supplied at the cabin for you, if you do not find one contact us right away and we will deliver this for you. **In the unlikely event that your rental home becomes unavailable to you for ANY reason during your stay, Big Bear Vacations reserves the right to offer a comparable property or to issue a full refund. ** Violations of the above Guest House Rules/Code of Conduct by yourself or anyone in your party will result in the immediate eviction of your group without refund of rent, security deposit and the addition of possible city imposed fines to the reservation holder. I have rented properties for the past 6 years at least 2 times a year. This is the first time I have used VRBO and I was not impressed. The house was a good size for our group but it came poorly stocked. There was very little in the kitchen, the jacuzzi was dirty (green colored) and the check in process at the rental company was not easy nor pleasant. The counter people kept allowing others to walk up and avoid the line despite the fact that there were well over 6 groups that had been waiting. I feel like I could have gotten a better house for the same price. Thank you for sharing your voice. We appreciate the feedback and have shared it with the Team. You are important! We hope you do come for another visit soon so that we can show you a much better experience. It wasn't quite what was advertised. One of the "bedrooms" that had a ton of beds in it you had to go through the master bedroom to get to. I reserved this cabin because it was listed as a 4 bedroom and we had 4 couples. I didnt appreciate that in order to get to my room or go to the bathroom I had to invade someone else's room and privacy. It should be clear in the description that that is the situation. There is also a weird widow square opening in the master bedroom to the living room which is so weird because if anyone is up watching TV the lights shine into the master room. Also on the description it lists that they had a dishwasher but in the rental agreement with the company it is an additional charge to use the dishwasher. Also it lists that check in is flexible what it doesn't say is that if you want to check in before 4pm you have to pay a fee. On the booking page it does list that you have to pick up the keys at THEIR office but if I hadn't scrolled all the way down I would have no idea that I would have to go to the office to pick up the key at the office and return it to their office the next day. Also the kitchen was completely unorganized we couldn't find anything in there without opening and closing all the drawers and cupboards. There was a coffee maker there but we couldn't find the coffee pot. There were webs on the ceiling and one of the bathrooms didnt have a trash can. Also when we arrived everything was unplugged (lights, TV, etc...) which just seemed odd. Overall, I wasn't impressed at all with this cabin or our stay here especially for the price. Gracias por ser nuestro invitado. Nos esforzamos por la excelencia y apreciamos la retroalimentación. Estoy muy contento de tener una gran visita a Big Bear y una experiencia feliz - suave con Big Bear vacaciones. Es genial saber que hiciste unos maravillosos recuerdos. Esperamos su próxima visita!